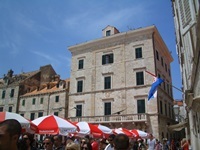 Hotel Stari Grad is one of two hotels located in Dubrovnik's Old Town. 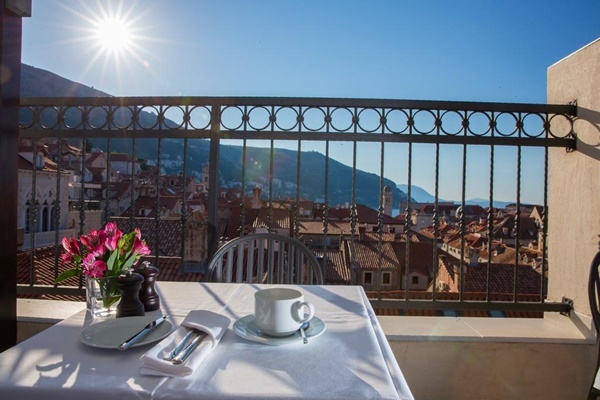 This recently renovated hotel makes perfect base for exploring historical attractions of Dubrovnik. 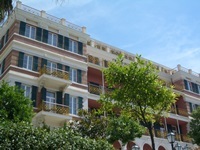 Hotel is situated in quiet street just few steps from the main Dubrovnik street - Stradun. Hotel has a rooftop terrace which is a great place to have a drink or enjoy the views over the Old Town. Please note that you need to climb the stairs to reach the hotel. Only short walk from the hotel you will find a great choice of taverns and restaurants. Numerous souvenir shops will attract you to buy reminder of your Dubrovnik holiday. This hotel offers 8 spacious rooms with luxurious beds, flat screen TVs and air conditioning. Room amenities include air-conditioning, en-suite bathroom, satellite TV, safety deposit box, direct dial phone and free Wi-Fi internet access. Hotel Stari Grad has no own restaurant. Guests get a voucher for breakfast at the nearby café. From this hotel you can reach the popular Banje beach on foot in just 5 minutes. To reach Lapad & Babin Kuk beaches take city bus no.6 from Pile Gate (10 - 15 minutes bus ride). The island of Lokrum, located just 0.5 km from the Old Town, is a perfect spot for a boat trips during hot summer days. The boat to Lokrum departs from Old harbour which is located only 2 minutes walk from this hotel. Free Wi-Fi internet access is available at the hotel rooms. Public parking is available at a location nearby (reservation is not needed) and charges are applicable. FROM DUBROVNIK AIRPORT: Take the airport shuttle bus to Pile Gate. When you enter the Old Town, walk down the Stradun. Hotel is located in the 2nd street on the left hand side. FROM DUBROVNIK PORT/MAIN BUS STATION: Take any city bus running to Pile Gate (No.1A, No.1B, No.3) from Gruz neighbourhood. Travel until the last stop. From there enter the Old Town and walk down the Stradun. Hotel Stari Grad is located in the 2nd street to the left. FROM BABIN KUK/LAPAD: From Babin Kuk you should take city bus no.6, and from Lapad city bus no.4 and travel to Pile Gate. From there you can easily walk to the hotel.